Fire TV has been my favorite Kodi box and we have published numerous articles on Fire TV and Kodi. I expressed my disappointments with the new Fire TV 2015 and concluded that at this point, the 2014 version is better than 2015 model. There has been a series of software updates that have fixed some of the problems. Few other problems are expected to be fixed with future software updates. Failed software update is one another problem I encountered with the 2015 model Fire TV. While setting up the new 2nd generation Fire TV, after you choose the language and connect to network, it automatically proceeds to checking for update. You may see the following screen. Without updating your newly received Amazon Fire TV you cannot proceed to using it. This can be quite frustrating. Its true, all you need is patience and nothing more. When your Fire TV update fails with the above error message just hang tight and wait. In a few seconds you should see the download resume but with the warning that “The download seems slower than normal. Please checking your internet connection.”. Continue to wait and let the download and software update continue. In my case, the new Amazon Fire TV firmware update was downloaded eventually and applied successfully while on my Wireless G network. Try a different internet network. This is not always easy but sometimes other internet networks are available – eg. hotspot from your mobile phone, neighbor's wireless, etc. 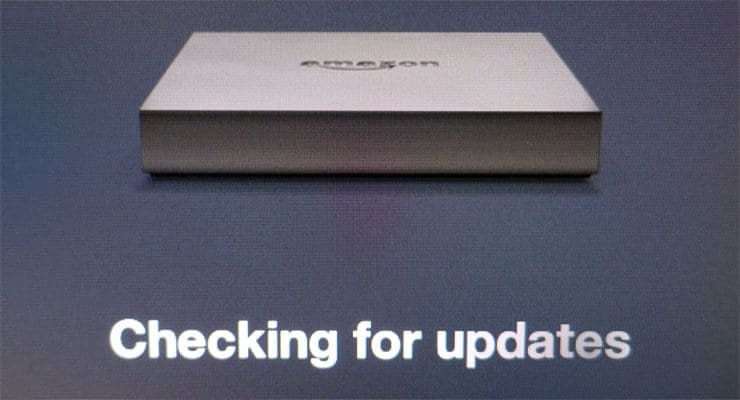 Even with above attempts to get the Amazon Fire TV software update, you may still reach a dead end and may be asked to visit amazon.com/devicesupport. I found nothing helpful on that page. Amazon dropped the ball quite a bit with is new release. Many non-tech savvy users will be lost and tech-savvy users may not have the patience. Due to reasons like these, I found the 1st gen Fire TV to be better than the 2nd gen. If other methods works for you please share it with other readers in the comments section. I hope the new software releases fix the Amazon Fire TV update error.